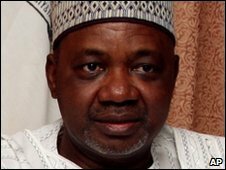 Both houses of Nigeria's parliament have voted to confirm the appointment of Kaduna state governor Namadi Sambo as the country's new vice-president. Mr Sambo is relatively unknown and his appointment could clear the way for President Goodluck Jonathan to seek election in 2011, analysts say. There were rowdy scenes during the confirmation, with lawmakers screaming and shouting to delay proceedings. Mr Sambo is a northerner and he maintains the regional balance. President Jonathan, a southerner, was sworn in earlier this month after the death of Umaru Yar'Adua. Mr Jonathan has not said whether he wants to stand for the elections and the governing People's Democratic Party has said its candidate will be a northerner - continuing its practice of alternating power between the mostly Muslim north and the largely Christian south after two four-year terms. Mr Yar'Adua, who was a northerner, died before his first term ended. The BBC's Caroline Duffield in Lagos says that although Mr Sambo is not seen as a strong contender in the elections, his appointment is still controversial. In his home state of Kaduna, Mr Sambo is seen as weak and inexperienced - his administration is criticised as corrupt. His replacement in Kaduna will be his deputy Patrick Yakowa, who is a Christian. Our correspondent says that has prompted anger because the state is divided between Muslims and Christians. Some local politicians see it as a plot to hand political control locally to the Christian community. The confirmation hearing in the House of Representatives was held up for nearly half an hour as lawmakers argued on procedure, some even suggesting it be suspended to allow for consultation with constitutional experts. At one point, those supporting the Kaduna governor began singing "Give us Sambo", while House speaker Dimeji Bankole repeatedly called for order. "I am pleading with colleagues to please to take their seats and take this matter with all sense of patriotism," Mr Bankole said at one point. Eventually, the House confirmed Mr Sambo as vice-president. Senators had earlier approved him unanimously in a vote that lasted three minutes. Married with six children, Mr Sambo is an architect and an ally of former military ruler Ibrahim Babangida, who intends to seek the presidency.